Draft: 2010, Minnesota Twins, 4th rd. Eddie Manuel Rosario (pronounced row-SAW-ree-oh)...Twitter: @EddieRosario09...Instagram:@e_rosario20...attended Rafael Lopez Landron (PR) High School; one of five players from that school to be drafted by major league teams...he and his wife Milany, had their third child, a boy named Lucas, on June 11, 2015...held a youth baseball clinic in his hometown of Guayama, PR during the Twins trip to Puerto Rico for a two-game series vs. Cleveland...participated in 2017-18 and '18-19 Twins Winter Caravan. Was Twins Opening Day leftfielder while batting fourth March 29 at Baltimore, going 1-4 with a walk...Played in both games in his home country during the Puerto Rico series April 17-18 vs. Cleveland, going 3-for-11 in the series...scored winning run in second game of series in 16th inning...Hit third career grand slam April 20 at Tampa Bay...Recorded an extra-base hit and scored a run in seven straight from May 1-7, the longest streak of such instance in Twins/Senators (since 1901) history...Recorded second career multi-homer game May 11 at Los Angeles-AL, the fifth of his career (3-homer game later in season)...Hit .368 (43-for-117) with 11 doubles, six home runs and 21 RBI in 28 May games...his 43 hits were tied for second most in baseball and 11 doubles were tied for sixth...also the 43 hits were the third most in club history for May (49 for Oliva in 1964 and 44 for Puckett in 1988)...Recorded second career three-homer game June 3 vs. Cleveland, including the walk-off winner, the second of his career...one of eight players in club history with a three-homer game (Bob Allison, Harmon Killebrew, Tony Oliva, Justin Morneau, Max Kepler, Brian Dozier and Byron Buxton), the only to do it twice...Hit .330 (34-for-103) with eight doubles, nine home runs and 19 RBI in 26 June games...nine home runs were tied for seventh most in baseball...Hit .311 (117-for-376) with 24 doubles, two triples, 19 home runs, 60 RBI, 64 runs scored and a .890 OPS prior to the All-Star break... was one of five players considered for the AL Final Vote, joining Jean Segura, Andrew Benintendi, Andrelton Simmons and Giancarlo Stanton (Segura was the winner). Made first career infield appearance, playing 2.0 innings at third base July 27 at Boston (2 chances, 2 assists)....Suffered right quad tightness August 30 at Cleveland, missed a week, returned for eight games then shut down due to quad late-September...Hit .310 (31-for-100) in 26 games from the number three spot in the order...Led Twins in at-bats (559), runs (87), hits (161), home runs (24), RBI (77), multi-hit games (48), and second in doubles (37)...Ranked tied for fifth in the AL in outfield assists (9)...Finished tied for 10th in the AL in multi-hit games and tied for 16th in hits...Was one of 16 players in baseball and one of seven American Leaguers with at least a .285 batting average, at least 150 hits, at least 30...doubles, at least 20 home runs and at least 75 RBI...Given Calvin R. Griffith Award for Twins Most Valuable Player, voted on by the Twin Cities Chapter of the BBWAA. Played for Puerto Rico in the World Baseball Classic, hitting .316 (6-for-19) with two doubles, one triple, five RBI and three runs scored in six games ... Made Twins Opening Day roster for second time in career and was Opening Day leftfielder, batting ninth April 3 vs. Kansas City ... Hit safely in career-high 15 straight April 17-May 5, hitting .404 (23-for-57) with three doubles, three home runs and seven RBI during the streak ... Hit three home runs June 13 vs. Seattle, becoming the seventh player in club history with a three-homer game, joining Bob Allison (May 17, 1963 at Cleveland), Harmon Killebrew (September 21, 1963 at Boston), Tony Oliva (July 3, 1973 at Kansas City), Justin Morneau (July 6, 2007 at Chicago-AL), Max Kepler (August 1, 2016 at Cleveland) and Brian Dozier (September 5, 2016 vs. Kansas City); also set a career high with five RBI ... Recorded a career high with five hits July 1 at Kansas City, all singles ... Earned AL Player of the Week August 13, hitting .444 (12-for-27) with 10 runs scored, three doubles, four home runs, nine RBI and a stolen base over seven games...among AL players, he finished the period first in runs scored and total bases (27); tied for first in home runs and extra-base hits (7); second in slugging percentage (1.000); tied for second in RBI; tied for third in hits; fifth in batting average; and tied for fifth in doubles ... Hit second career grand slam August 20 vs. Arizona; according to Elias, only one other first-, second-, or third-place batter in franchise history had ever hit a grand slam in the first inning; on June 28, 1933, Hall of Famer Heinie Manush, batting second in the Washington Senators lineup, hit a first-inning grand slam in a 15-2 win at Cleveland ... Hit first career walk-off home run September 13 vs. San Diego ... Hit .300 (91-for-303) from July 1 through the end of the season; hit .321 (27-for-84) in 23 July games, .307 (35-for-114) in 29 August games and .276 (29-for-105) in 27 September games ... Hit .279 (48-for-172) against left-handed pitching and .295 (109-for-370) against right-handed pitching ... Set career highs in games (150), runs (79), hits (157), doubles (33), home runs (27), RBI (78) and walks (35) ... Ranked second on club in doubles, RBI and runs, and ranked third in hits and home runs ... Made postseason debut in AL Wild Card game October 3 at New York-AL, going 1-for-3 with a home run and two RBI...hit two-run homer in first at-bat (off Luis Severino)...one of four players in club history to homer in first career postseason at-bat, joining Don Mincher (Game 1 of World Series in 1965 vs. Los Angeles-NL), Gary Gaetti (Game 1 of 1987 ALCS vs. Detroit), and Brian Dozier, who did it three batters prior to Rosario...Rosario and Gaetti are the only two players in baseball history to homer in both their first career regular season at-bat and first career postseason at-bat. Made Twins Opening Day roster, first of his career...was Opening Day leftfielder, batting fifth April 4 at Baltimore. Hit first career pinch-hit homer April 19 at Milwaukee. Tied career-high with four hits, three times: April 21 at Milwaukee, July 9 at Texas and July 23 at Boston. Hit .200 (23-for-115) with seven extra-base hits in 32 games and was optioned to Triple-A Rochester May 19. Played 41 games for the Red Wings and hit .319 (51-for-160), including a stretch of 25 games from May 25-June 21, where he hit .418 (41-for-98). Recalled from Rochester July 1. Hit .316 (24-for-76) in 20 July games and .311 (32-for-103) in 28 August games for Minnesota. Hit second career pinch-hit homer August 5 at Tampa Bay; came in the seventh inning that turned a 2-1 deficit into a 3-2 lead and eventual 6-2 Twins victory...according to the Elias Spots Bureau, it was the first pinch-hit home run that turned a deficit into a lead for the Twins since Matt LeCroy hit a pinch-hit grand slam at Toronto May 19, 2004. Hit 10th home run September 17 at New York-NL, giving him double-digit home run totals in consecutive seasons. Fractured left thumb sliding into first base September 17 at New York-NL, ending his season. Combined to hit .285 (141-for-495) with 31 doubles, 17 home runs and 57 RBI in 133 games between Rochester and Minnesota. Played in first career spring training with Twins and optioned to Triple-A Rochester March 28....Played 23 games for the Red Wings, hitting .242 (23-for-95) with two doubles, one triple, three home runs and 12 RBI.... Recalled from Triple-A Rochester May 4 when Twins placed outfielder Oswaldo Arcia on 15-day disabled list. AMade major league debut May 6 vs. Oakland and homered on first pitch he saw, off Scott Kazmir, becoming the 10th Twin to ever homer in his first career game and sixth to ever homer in his first at-bat as Twin...according to Elias, he became one of 115 players in baseball history to homer in first career at-bat and one of 109 payers to homer in first plate appearance...according to Baseball Almanac, he became the 29th player in baseball history to homer on first pitch....Drove in at least one run in each of first four career games May 6-9, setting a Twins/Senators franchise record...the last Twin/Senator who had an RBI in at least each of his first three career games was Bob Oldis, May 10-June 25, 1953...was third player in baseball to record an RBI in each of first four games played on season (Corey Dickerson and Lorenzo Cain).... Hit safely in season-high eight straight games May 24-June 3, hitting .407 (11-for-27) in that span....Placed on Paternity List June 9 to attend birth of son Lucas in Miami, missing one game.... Recorded 25 hits in June, fourth most among AL rookies...also scored 13 runs, tied for third most among AL rookies....Tripled in three straight games July 28-30, becoming the fourth player in club history to do so, joining Rod Carew (1977), Dan Gladden (1991) and Delmon Young (2008)....Went 3-for-5, falling a single short of the cycle July 30 vs. Seattle, lining out in final two at-bats, one to centerfield and one to shortstop... he became the first rookie in club history to have two games with at least three extra-base hits in one season....Hit ninth triple August 16 vs. Cleveland, tying Tony Oliva for most triples by a rookie in Twins history; hit 10th August 25 at Tampa Bay, setting Twins rookie record...also homered in that game becoming the first Twins rookie to homer and triple in same game since Gary Gaetti, who did it twice in 1982. A Stole his 10th base August 30 vs. Houston, becoming the ninth different Twin (17th time) with 10-plus steals and 10-plus triples in a season and first-ever rookie; the last to do so was Denard Span in 2009 (10 triples, 23 steals)...also became the first rookie in baseball with 10-plus steals and 10-plus triples since Alcides Escobar and Austin Jackson both did it in 2010....Hit first career grand slam September 3 vs. Chicago-AL, off Jeff Samardzija; one of three grand slams for a Twin on the season.... Hit 10th home run September 16 vs. Detroit, becoming the ninth different Twin (11th time) to record double-digit triple and homer totals in a single season and first since Cristian Guzman (2001)...became first rookie in baseball since Hanley Ramirez did it for Florida in 2006....Was one of four players in baseball to post double-digit totals in doubles, triples and home runs, joining Evan Gattis, Kevin Kiermaier and David Peralta. ...Led baseball in triples (15), which was the most for a rookie since 1991 when St. Louis' Ray Lankford had 15.... Ranked first among AL rookies in triples, third in games (122) and multi-hit games (34), fourth in runs (60), tied for fifth in home runs (13), and fifth in RBI (50)....Tied for second in baseball in outfield assists (16) and led all rookies...it marked the most for a rookie since 2007, when Delmon Young had 16 for Tampa Bay...it tied Kirby Puckett's 1984 total for most in Twins history for rookies and tied for fifth most among any Twins in club history....Given Jim Kaat Award for Twins Defensive Player of the Year as voted on by the Twin Cities Chapter of the BBWAA. Missed time serving 50-game suspension and reinstated May 29; began season with Single-A Ft. Myers...Played eight games for the Miracle, hitting .300 (9-for-30) and promoted to Double-A New Britain June 6...Recorded two-homer game July 22 vs. Altoona...Combined to hit .243 (84-for-346) with 20 doubles, three triples, eight home runs, 40 RBI and 45 runs scored in 87 games between both levels...Played 72 games in the outfield (50 in centerfield) and 18 at second base at both levels combined...Participated in the Arizona Fall League, playing for the Salt River Rafters, hitting .330 (33-for-100) with 18 RBI and 10 stolen bases in 24 games; lost batting title to Cincinnati prospect Jesse Winkler (.338) on final day of season...named to AFL East Fall Stars Team...Went 4-for-5 with a double and home run...Ranked 10th best prospect in Twins system by Baseball America entering 2015...Added to Twins 40-man roster November 20. Began exhibition season playing for Team Puerto Rico in the World Baseball Classic, hitting .214 (3-for-14) with one double and four strikeouts in six games...converted to full-time second baseman from outfielder, playing 115 games at second between two levels combined... began regular season with Single-A Ft. Myers...hit .346 (36-for-104) with seven doubles, three home runs and 19 RBI in 25 April games, including two four-hit games: April 7 at Bradenton and April 19 at St. Lucie...promoted to Double-A New Britain June 10...named Eastern League Player of the Week for the period of August 19-25, hitting .433 (10-for-30) with four doubles, one home run, eight RBI, five runs scored and a .667 slugging percentage in seven games...combined to hit .302 (150-for-496) with 32 doubles, eight triples, 10 home runs, 73 RBI and 80 runs scored in 122 games between both levels...played in the Arizona Fall League with Glendale Desert Dogs, hitting .238 (19-for-80) with one double, one triple and seven RBI in 20 games...named to West Division Fall Stars Team...named second baseman on MiLB.com Twins organizational All-Star team... received 50-game suspension January 4, 2014 for violating the Minor League Drug Prevention and Treatment Program. Started season with Single-A Beloit...hit .293 (70-for-239) in 62 games before being placed on 7-day disabled list June 12 with a broken cheek bone after getting hit in the face during batting practice; played five games on rehab assignment with GCL Twins and was reinstated July 31...named to Midwest League All-Star team...hit .309 (95-for-307) against right-handed pitching and .247 (21-for-85) against left-handed pitching...played 71 games at second base and 20 in centerfield for both levels combined...ranked 12th best prospect in Midwest League by Baseball America...named outfielder on MiLB.com's Twins organizational All-Star team...played in the Puerto Rican Winter League with Indios de Mayaguez and named Postseason All-Star...ranked seventh best prospect in Twins organization by Baseball America entering the 2013 season. Spent entire season with Rookie Elizabethton...named Appalachian League Player of the Week three times: June 27, August 22 and August 29...homered in four straight games June 26-29, including first career two-homer game June 29 at Johnson City; second two-homer game August 19 at Greeneville; and third two-homer game August 25 at Bluefield...named Twins minor league Player of the Week July 1, hitting .393 (11-for-28) with two doubles, five home runs and 12 RBI in seven games...named Appalachian League co-Player of the Year...named Appalachian League Postseason All-Star...named Topps Short-Season/Rookie All-Star...received MiLB Round Tripper Award, Short-Season...named MiLB.com ShortSeason Hitter of the Year...named to MiLB.com Twins organizational All-Star team...named to Baseball America Rookie All-Star team...played for Indios de Mayaguez in Puerto Rican Winter League, hitting .214 (9-for-42) in 16 games. Started professional career with GCL Twins...played all 51 games in the outfield (34 in centerfield)...led Gulf Coast League in stolen bases (22), finished third in hits (57), and 10th in batting average (.294)...ranked 21st best prospect in Twins organization by Baseball America entering 2011 season. January 27, 2017 OF Eddie Rosario assigned to Puerto Rico. October 3, 2016 Minnesota Twins activated LF Eddie Rosario from the 15-day injured list. September 20, 2016 Minnesota Twins placed LF Eddie Rosario on the 15-day disabled list retroactive to September 18, 2016. Left thumb fracture. July 3, 2016 Minnesota Twins recalled LF Eddie Rosario from Rochester Red Wings. May 19, 2016 Minnesota Twins optioned LF Eddie Rosario to Rochester Red Wings. 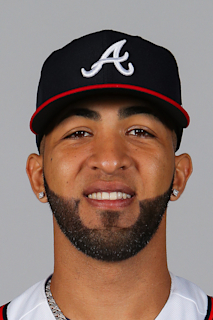 October 29, 2015 OF Eddie Rosario assigned to Indios de Mayaguez. October 29, 2015 Indios de Mayaguez activated OF Eddie Rosario. June 11, 2015 Eddie Rosario roster status changed by Minnesota Twins. June 10, 2015 Minnesota Twins placed CF Eddie Rosario on the paternity list. May 4, 2015 Minnesota Twins recalled CF Eddie Rosario from Rochester Red Wings. March 28, 2015 Minnesota Twins optioned CF Eddie Rosario to Rochester Red Wings. November 20, 2014 Minnesota Twins selected the contract of Eddie Rosario from Chattanooga Lookouts. October 30, 2014 CF Eddie Rosario assigned to Indios de Mayaguez. June 6, 2014 Eddie Rosario assigned to New Britain Rock Cats from Fort Myers Miracle. May 29, 2014 2B Eddie Rosario assigned to Fort Myers Miracle from New Britain Rock Cats. May 22, 2014 OF Eddie Rosario assigned to New Britain Rock Cats. January 29, 2014 OF Eddie Rosario assigned to Puerto Rico. January 4, 2014 New Britain Rock Cats placed 2B Eddie Rosario on the restricted list. November 18, 2013 2B Eddie Rosario assigned to Indios de Mayaguez. November 10, 2013 2B Eddie Rosario assigned to Indios de Mayaguez. August 27, 2013 2B Eddie Rosario assigned to Glendale Desert Dogs. June 10, 2013 2B Eddie Rosario assigned to New Britain Rock Cats from Fort Myers Miracle. April 1, 2013 Eddie Rosario assigned to Fort Myers Miracle from Cedar Rapids Kernels. February 23, 2013 IF Eddie Rosario assigned to Minnesota Twins. July 31, 2012 Beloit Snappers activated OF Eddie Rosario from the 7-day disabled list. July 25, 2012 sent OF Eddie Rosario on a rehab assignment to GCL Twins. June 13, 2012 Beloit Snappers placed OF Eddie Rosario on the 7-day disabled list. April 4, 2012 OF Eddie Rosario assigned to Beloit Snappers from Elizabethton Twins. June 20, 2011 Eddie Rosario assigned to Elizabethton Twins from GCL Twins. June 16, 2011 GCL Twins placed OF Eddie Rosario on the reserve list. October 22, 2010 RF Eddie Rosario assigned to Indios de Mayaguez. June 21, 2010 OF Eddie Rosario assigned to GCL Twins from Minnesota Twins. June 20, 2010 Minnesota Twins signed OF Eddie Rosario.